But most of the time, most of us do like chocolate. And many people really like it very much… I’m not the chocolate fanatic some people are (including my mom – and Rich…) but when I stopped eating sugar it was one of the flavors I was afraid I would miss. The issue with unsweetened chocolate is that it is bitter – and most of us, in most cases, don’t like the bitter flavor. With good evolutionary reason – many things that taste bitter are not good for us to eat. Well – I suppose one could debate the wholesomeness of the bitter foods we do eat – coffee, and chocolate, and hops in beer… but there we are, we do eat them, we (mostly) like them, and we make them palatable with other flavors. (Beer is atypical here – we deliberately add the bitter hops for flavor. But I’m not going to sidetrack into a discussion of beer…) Chocolate is used without sweeteners in Mexican mole, blending the bitterness with heat – but good as that can be, it is not what most of us mean when we say “I’d just like something chocolate…” Chocolate candy with high cacao content, and very little sugar, is becoming more popular – we are moving to appreciating the more bitter flavors – but milk chocolate is still the most popular in the US, using dairy as well as sugar to smooth out the flavor. Hmm. Smooth. Not just sweeten… When I hadn’t eaten sugar for a while, I did discover unsweetened chocolate almond milk (only sporadically available in one store in my neighborhood) which is a lovely thing – and which gave me back hot chocolate. Aha… I don’t need it actually sweet, as long as the bitter edge is tempered… Then I saw some mentions of Tofu Pudding, made with silk tofu. Now, they all were sweet, but… I remembered making sauces and soups with tofu. They come out beautifully creamy, but can be awfully bland, if you don’t watch out – tofu absorbs flavor, and smooths it out. Wait – isn’t that what I want, here? Well – I had some unsweetened baking chocolate. I did want a little sweetness – not added sugar, and not a sugar substitute, but fruit… Bananas work well in many desserts, and the flavor goes well with chocolate. So I started playing – and was astonished. Not only is this distinctly chocolate, without being too bitter, but it also has an amazingly smooth and silky mouth feel – more like mousse than pudding, really. So I’ve been making this for a couple of years, now, and I keep the ingredients on hand. 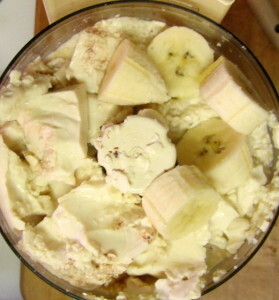 I always have a sliced banana or two in the freezer for use in cooking, if I haven’t any fresh – the last 1or 2 of a bunch are usually overripe by the time we get to them, but the overripe ones are better for making desserts… and everything else is shelf stable. And on the rare occasions when I want a creamy treat, it’s easy enough to whip up – almost as easy as instant pudding mix, in fact (and so much better!) Oh, and yeah – it’s vegan… which doesn’t matter one way or the other to me, but it’s always nice to know I have a creamy dessert I can serve a vegan friend – or one who is dairy intolerant. I start with silk tofu in an aseptic pack. These hold something around 12 ounces (they vary a bit.) Silk tofu does not have whey strained off during the process of making it, and is therefore softer, smoother and less concentrated than regular (“cotton”) tofu. If you can only readily get regular tofu, get soft if you can, and it will work, but not quite as well – the texture is a little grainy. If you can get fresh silk tofu, go for it – just remember that the package is probably larger, so just use 12 ounces. I have not yet tried it with the Asian Tofu Pudding in tubes (another form of silk tofu) but I suspect that would work wonderfully well. And then, it could not be easier. 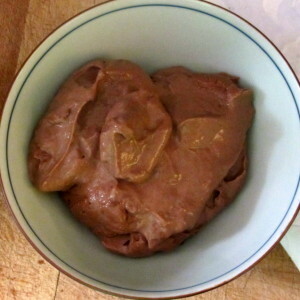 Soften 2 ounces of unsweetened baking chocolate – I use the microwave, 30 seconds at a time. 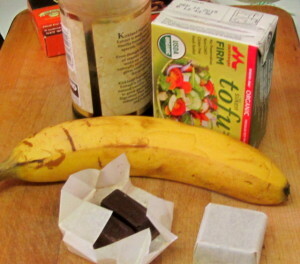 Then place one pack of tofu, drained, one banana, cut up, and 1 teaspoon of vanilla extract into a food processor. 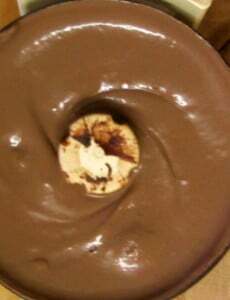 Add the chocolate and process. I stop a few times to stir it down and in, and then whirr again. Continue until totally smooth. 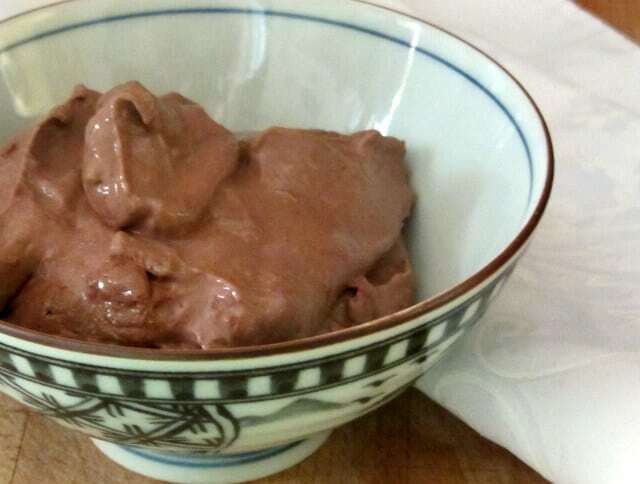 Oh – all ingredients at room temperature, please, and if you are using a frozen banana thaw it first – otherwise the chocolate doesn’t blend in smoothly. If you don’t have a food processor, I’ve done this with an immersion blender with good results. It’s too thick to work well in a regular blender jar, though. Now – disclaimer – I have shared the recipe with friends who don’t eat sugar, and who love it, but I haven’t tried it on someone who has a sweet tooth. I like it, Rich (who does eat sugar, and does eat chocolate cake and mousse and candy, but doesn’t have a serious sweet tooth) likes it – in fact, he has been urging me to write about it. I really see this for someone who already eats little or no sugar. I suppose you could make it with bittersweet chocolate… Don’t try it with cocoa powder, though. The cocoa butter makes a major contribution to both flavor and especially texture. I’ve actually tried the concept with other flavorings, and have yet to find one I like as much – and the creaminess of the cocoa butter seems to be the primary factor. 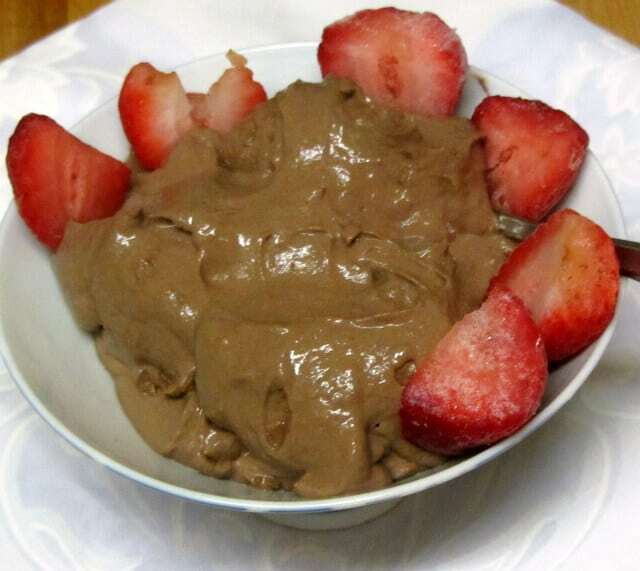 So if you – or your sweetheart – miss chocolate at this time of year, try this creamy chocolate dessert. 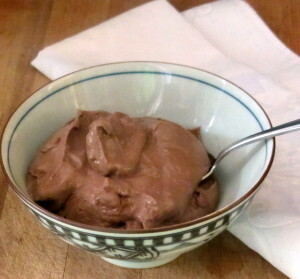 Sugar free chocolate pudding that is also vegan - and creamy, chocolaty, and as easy as instant. What's not to love? Combine all ingredients in a food processor. Process, stopping periodically and stirring down, until completely smooth. This sounds so delicious! I love tofu - it can take on any flavor!